You know you've succeded in the world when you have a dish named after you! This omelette which I've made several times now; was as the story goes created for novelist Arnold Bennett http://www3.shropshire-cc.gov.uk/bennett.htm during his stay at the Savoy Hotel in London. 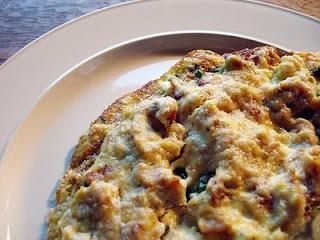 It is an opulent and rich open faced omelette made from a mixture of cheese and smoked haddock. One of my favourite variations on the original is that of Gordon Ramsay's and here is his recipe. Other variations that I recommend include the use of Gruyere cheese, Dijon mustard, and Worstershire sauce. More on those in future posts. The secret to any good omelette is to use a lightly oiled, heavy-based pan. Add a knob of butter and only once it starts to foam do you add the eggs. Then you stir the eggs constantly to beat in some air, and tilt the pan from side to side to make any uncooked egg run to the sides. 1 Blend the flour and butter together to make a paste, then chill until firm. Pour the milk into a small pan and add the bay leaf, peppercorns and onion. Heat the milk gently over a low heat to just below boiling point. Lower in the haddock skin-side down. 2 Cover the haddock with a dampened piece of greaseproof paper and poach gently for about 4 minutes, until the fish is just beginning to show signs of flaking when pressed. Remove the fish from the milk with a slotted spoon and, when it is cool enough to handle, remove the skin and any bones and flake into small pieces. 3 Strain the milk into a bowl and discard the aromatics. Pour 100ml of the infused milk into a clean small pan and return to the heat. Gradually whisk in the butter paste, adding small pieces at a time, and bring to the boil. Cook for 1-2 minutes, whisking constantly until you have a smooth sauce. 4 Put the yolks in a bowl and beat lightly with the cream. Gradually whisk in the sauce, then fold in the haddock and half of the cheese. Check for seasoning. Preheat the grill to a medium setting. 5 Lightly oil an 18-20cm omelette pan and place over a medium to high heat. Break the eggs into a bowl, season and beat with a fork. Add a knob of butter to the pan and swirl it about to coat. When the butter starts to foam, pour in the eggs. Stir them continually, tilting the pan from side to side, until the eggs set on the bottom and the top is soft and creamy. 6 Remove the pan from the heat, then pour the haddock mixture on top of the omelette. Sprinkle over the remaining cheese and grill for a few minutes until golden brown. Garnish with sprigs of chervil or parsley and serve immediately.